It has been a very busy few months! Because I haven’t been able to post as much as I like, I am bringing you not one but THREE cards today! These three cards have been inspired by the Ellen Hutson Pin-Sights Challenge in the CLASSroom blog this month. I would love to know which is your favorite! Leave me a message in the comments with your thoughts! OH! Also, make sure you see the message at the bottom regarding a HUGE two day sale going on at Ellen Hutson! These beautiful delicious shades of Strawberry, Orange, and Lemon just scream SUMMER and inspired me to play with my Copic markers, Daniel Smith watercolor paints, and of course my Essentials by Ellen stamps and dies. Laurel did an AMAZING job of putting this month’s inspiration board together. I find when I am stuck in a creative rut, using a mood board and/or a sketch really gets me kick started and my creativity tends to flow from there. My first card share is one you may have seen over in the Ellen Hutson Classroom if you came over from the Ellen Hutson CLASSroom blog (If you have never visited me before, Welcome!) I was inspired by the bright yellow pop of the lemons in the table floral arrangement. The lemons gave me the idea to use the Essentials by Ellen “Stay Golden” stamp set and matching dies. I loved the sentiment “when life hands you pineapples…” “make Pina Coladas” and when I thought about the whole Life handing you pineapples it made me think of actual hands coming up from the bottom of the card holding up pineapples. I reached for the Avery Elle Hats Off stamp set which ended up being the perfect stamp set to work with the pineapples. The background was done by layering Daniel Smith Watercolors. I did this on two different pieces of Canson XL 140lb cold press watercolor paper. I cut one piece of the watercolor wash paper down to 4.25 x 5.5 (A-2 card size) and the other piece of painted paper I used for die cutting. I cut out three different sizes of flowers in the stay golden die set and I used a Hero Arts Ombre Light Peach to Dark Peach to stamp the flowers on top. I used a combination of Cracked Pistachio and Peeled paint Distress Oxide inks to stamp the leaves. The white accents I drew in with a signo white gel pen. I thought the sentiment looked best in a circle shape so I stamped it on a lighter painted scrap of watercolor paper and heat embossed that sentiment with WOW extra fine clear embossing powder. I gave the flowers different levels of dimension by gluing some down against the paper directly and others are on one layer or two layers of foam tape. I stamped and colored the hands border stamp from the Avery Elle Hats off stamp set with my copic markers. I stamped or drew on some accents that reminded me of hawaiian print shirts. Some patterns I accented with my white signo gel pen. I added a little foam tape behind the hands and the pineapples to make it look more like these hands were actually holding a big pineapple. I took a little Black Soot Distress ink on a ink blending sponge and lightly brushed the edges of the panel to give a vingnet look. To finish off the cover I added some Pretty Pink Posh confetti and used my spectrum noir clear glitter brush pen to add a little sparkle. When you open up the card you see the continuation of the sentiment which I stamped with Versafine Onyx Black ink and heat embossed with WOW super fine clear embossing powder. The drink filled coconut is from the “Stay Cool” waffle flower stamp set which I stamped and then colored with copic markers. I added a little Glossy accents on the straw to make it look like a shiny plastic straw. I think this is a great encouragement card to give to a friend who has had a bad day. The next card was inspired by the beautiful florals in the photo as well as the gorgeous “Bed of Flowers” Essentials by Ellen die. I had several pieces of watercolor paper that I was practicing watercolor washes with. Not wanting them to go to waste I thought I would cut them up with this beautiful die and piece them back together on a piece of cardstock that I covered with Be Creative tape. I used the darker die cut negative pieces more to the center of each flowers and going lighter as you got to the edge of the flowers. I put green watercolor negative die pieces in between all the roses. Once all of the pieces were glued down I matted the pieced together panel with a piece of gold mirror foil cardstock. I die cut two vellum hearts from the Essentials by Ellen Folk Heart dies as well as the Congrats die from the Essentials by Ellen zipper panel die set. I wound some gold thread around each end of the die cut and glued the ends to the back of the panel. I then glued that panel down to a peach colored cardstock card base. I think this would make a fantastic wedding card. My next card started out just as watercolor practice, with some beautiful Mondo Flowers from Ellen Hutson. I took the Essentials by Ellen Mondo Peony flower and stamped that on Arches cold press watercolor paper with Versamark ink. 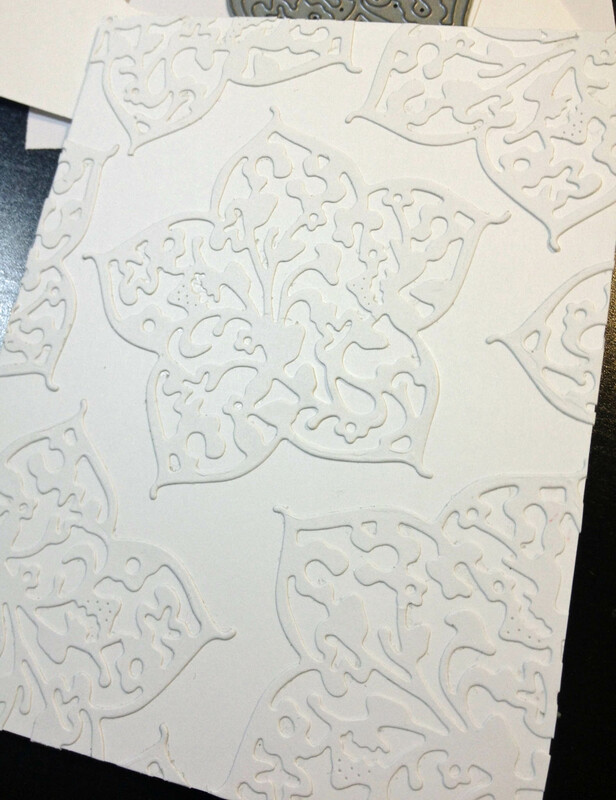 I heat embossed the flowers using clear extra fine embossing powder from WOW. I painted the florals using a mix of colors from Daniel smith paints in Quinacridone Rose, Rose Madder Perm, Transparent Pyrrol Orange, lemon yellow, and pearlescent shimmer. The leaves are painted using Sap Green. I liked my practice piece so I masked the flowers and stamped the Essentials by Ellen Mondo Hydrangea. I heat embossed this flower the same way and then I painted the flower using Daniel Smith quinacridone purple. The background got a light wash of blue by using Daniel Smith manganese blue hue. I set the florals aside to dry and I painted another piece of watercolor paper with the colors on my palette. Once that was dry I cut it using the largest Lawn Fawn fancy scallop rectangle die. You might notice that you can’t really see a shine of embossing powder on my card. Once the florals were dry my piece was warped quite a bit so I took a piece of copy paper and folded it in half. I placed my card in the middle and down on top of a microfiber cloth. On a no steam setting I ironed the paper protected card until it was flat and quickly removed the paper. The scrap paper absorbed all of the embossing powder leaving me with a one layer card that kept those white lines that I stamped with. I cut down my floral piece, matted it on gold mirror cardstock and foam mounted that piece on top of the scalloped watercolor panel. That was adhered to a heavy card base. Inside the card I glued a die cut Many Thanks from the essentials by ellen die and a scrap of that gold mirror cardstock. I stamped the florals in a very pale gray ink and colored them with Copics in various colors in the 00, 000, and 0000 shades. I thought this added a hint of color but light enough to write over when you write in the card. I hope you found some inspiration in the Ellen Hutson Pin-Sights inspiration piece as I did. Now its your turn to create something fabulous and participate in the challenge. One random participant will be chosen to win a $50 gift certificate to Ellen Hutson. Head on over to the Ellen Hutson classroom blog for more details. I cannot wait to see what you create! If you are interested in any of the products that I used in my projects today I have listed them below as well as linked them within the post. You may also click HERE for multiple online sources of some items. I tried to make it as easy as possible if you are wanting to find something that I used. 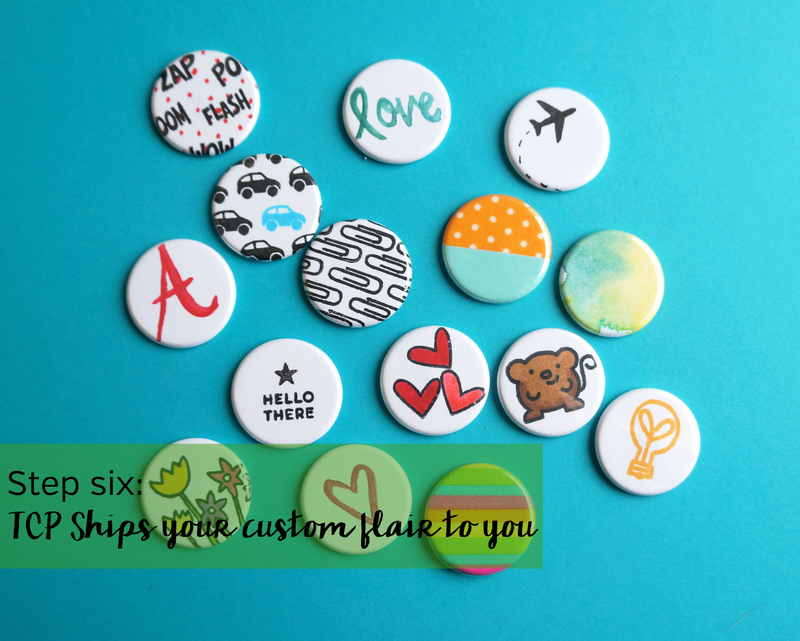 Turn your art into your own custom flair embellishments! Today I wanted to share with you something new and exciting in our Etsy shop! Starting today, you now have the option to create your very own flair buttons in two different ways! 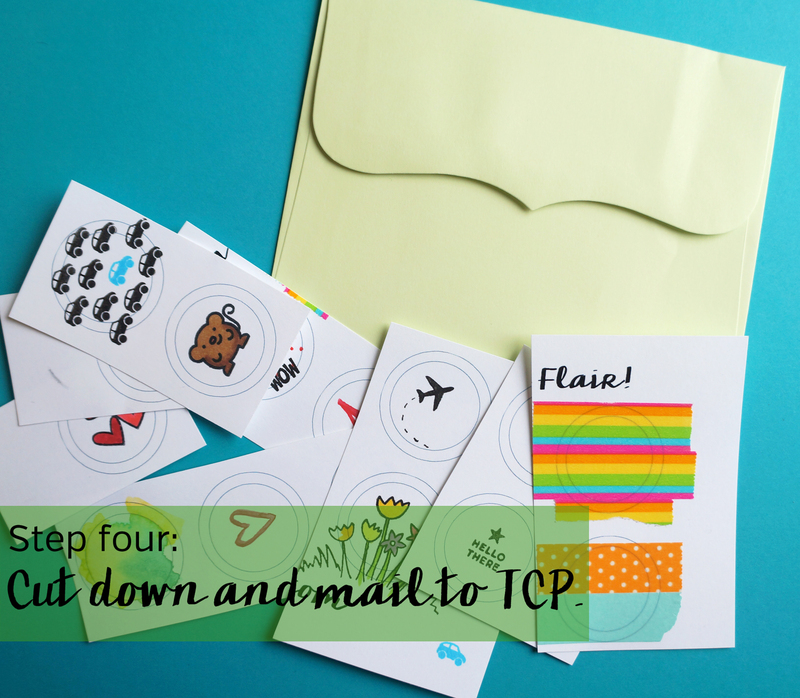 First, you will need to download our TCP Flair template (found HERE) then print the template on your favorite paper. I used Neenah solar white 80 lb cardstock but anything 80 lb or lighter will work. Then gather together all the supplies you would like to use to create your flair. You can use different types of coloring mediums, stamps, washi tape, anything smooth and flat will work. Now for the FUN part! Doodle and color your heart out! Hand letter some phrases for your project life album. Customize monograms or personalized buttons for gifts. Create cute page markers and charms for your planners. Use your favorite stamps (even digi stamps if your handy with photoshop) to create a unique embellishment! Little planner stamps work perfect for this project and most stamp sets have small images that are an inch or smaller. Make sure that you keep your artwork in the center circle, the rest will be cut off when making the flair. Once you are finished creating your little 1 inch works of art, Cut down the sheet so that it will fit in the envelope you are using. Keeping two or more circles per cut is preferred but not required. Go to our Etsy store listing HERE to order the amount and type of buttons you would like. If there is a different amount you are wanting than what is listed in our shop just send a custom order request and we can adjust the totals for you. Once you place your order we will send you the mailing address to send your artwork to. Once we receive your artwork we will send you a confirmation email so you know we have it in hand. We will then cut and create your flair for you and then ship it back. Remember that if you are requesting traditional flat backed flair you will get our signature low profile flat flair style making them perfect for projects that you don’t want to add a lot of bulk. Usual turn around time is 2-3 business days (sometime sooner) If a rush is needed please check before completing your purchase so we can make sure we can accommodate your request. 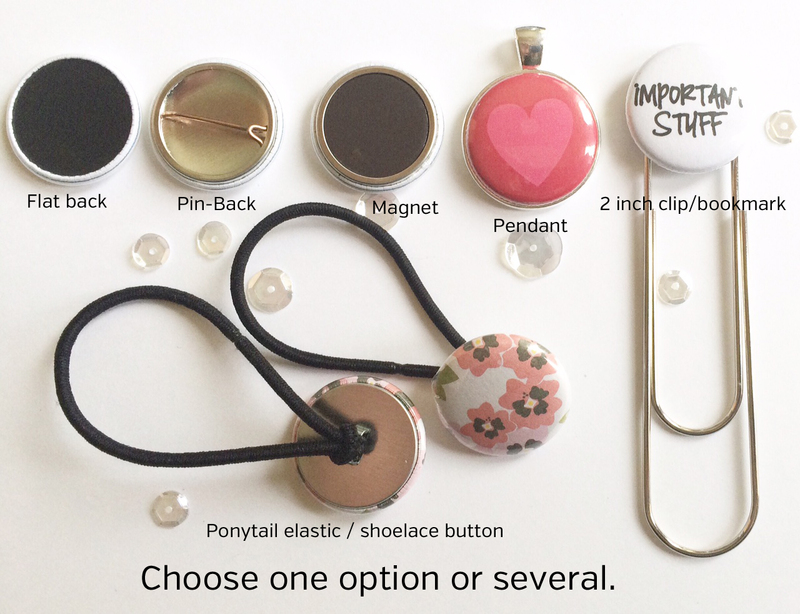 Remember, not only can you create traditional flat backed or pin backed flair buttons, but there is other options as well! I did mention that there was TWO new listings to create your own custom flair. The next option is super easy. Simply grab your favorite papers, Journaling cards, and scraps. Make sure they are NO SMALLER than 2 inches by 2 inches. Pop those papers in an envelope and once you complete your purchase though our store we will send you the mailing address to send these papers in. You can find this shop listing HERE. We will then turn your collection of papers, cards, and/or scraps into your made to match embellishments! This is a great way to get unique flair to match your favorite paper lines and core kits. What do you think? Sound like fun? Download the template and give it a try, There is no cost until you actually purchase the package you want to order. It is so much fun seeing something you create yourself made into a fun embellishment or accessory. I hope you are as excited about these new options in the store as we are! Let us know what you think and share with your friends about this fun new option and you could win a $5 gift certificate to our shop! Click on the rafflecopter giveaway for several chances to win (you can enter every day) winner announced on 6/18/15! NEW RELEASE BLOG HOP Die~Namites Dies has just released 32 new Fall and Christmas themed dies! leave a little love on each of the Design Team blogs. 5 ~ $10 Gift Certificates. Signing up for Email Notifications. So Let the HOP Begin! I have been working on my christmas cards since July, but I am nowhere near finished which was good because I absolutely fell in love with the new holiday release from Die-namites! 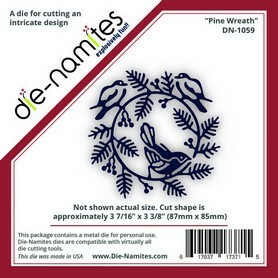 For today’s card I am using the Pine Wreath die. 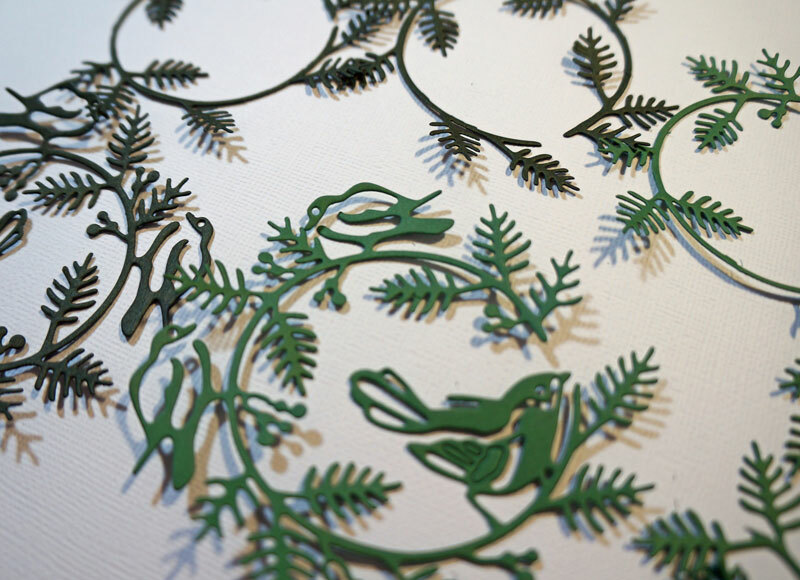 I love the intricate details of the pine, something I definitely could not achieve with a digital cut or punch. I started with the full cut on the bottom and layered pieces of the die that I had cut apart on top filling in the empty spaces to add more fullness to the die. I used a Zig ball point tip glue pen. 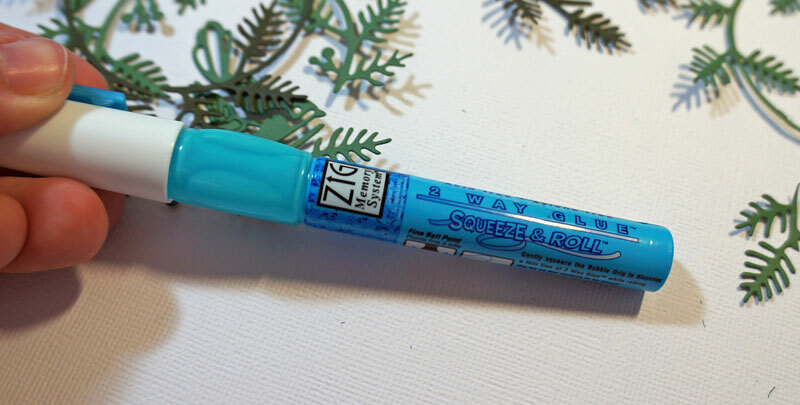 I chose this adhesive because its not too messy but easy to get into fine lines and not dry too fast. 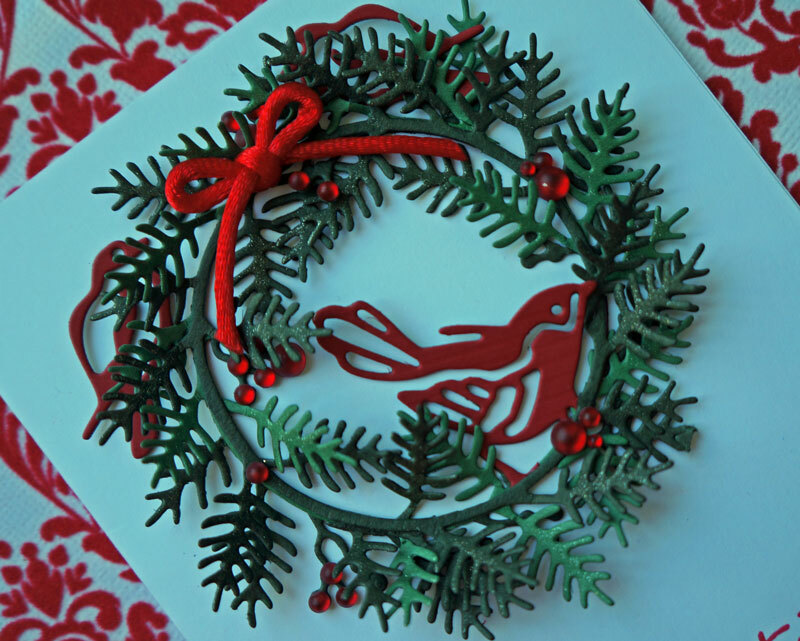 After layering all the greenery I made another cut out of red cardstock and cut the birds from the shape. I attached them using the same glue on top of the green cut that I started with. 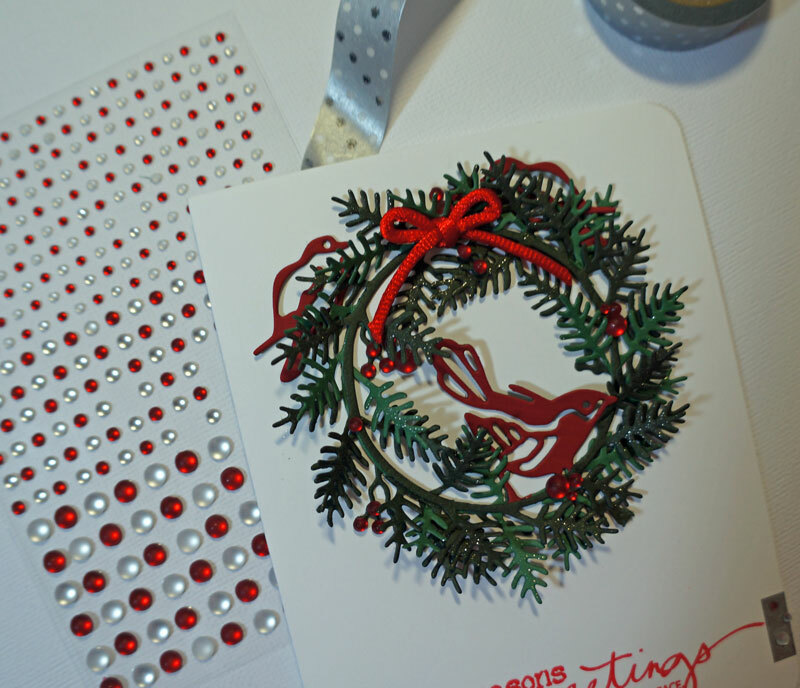 I glued the wreath to a white card (A2) and rounded the corners of the card. I attached some red gem dots (Recollections from Michaels) to make the berries around the wreath. Then I added some silver polka-dot washi tape around a stamped sentiment on the bottom. It was super simple but I love the results! What new release dies are your favorites? Be sure to keep an eye out on the die-namites blog for lots more holiday inspiration! Don’t forget to comment along your way to win one of 6 awesome prizes!!! 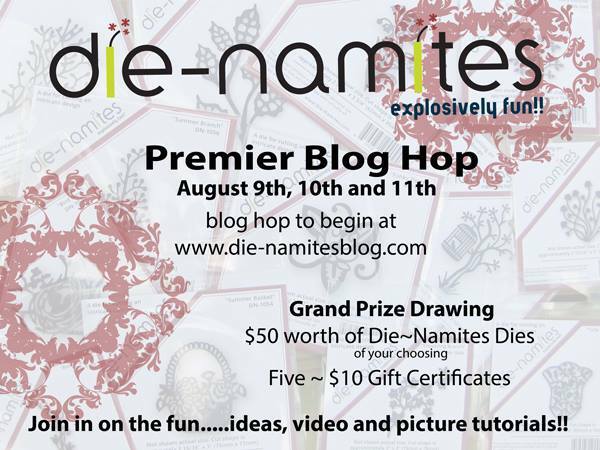 Welcome to the “Premiere” Die~Namites Dies Blog Hop. We are so happy that you have chosen to join us!!! Our blog hop will be from August 9th ~ August 11th. Along the way, you will see creations by our Die~Namite Design Team using the LATEST release of Die~Namites Dies. how they made their pieces through video and picture tutorials. will have a secret word…..on their blogs. to find the secret phrase this will give you one entry into our prize drawing. You will receive additional entries for Liking us on Facebook Signing up for Email Notifications. We will be awarding one Grand Prize of a $50 Gift Certificate to Die~Namites Dies and 5 ~ $10 Gift Certificates to Die~Namites Dies. So enough about the logistics…. LET THE HOP BEGIN…. If you have arrived here from Lisa Tottle’s blog you are in the right place. If you have just arrived in the midst of our Blog Hop please head to the Die~Namites Blog. 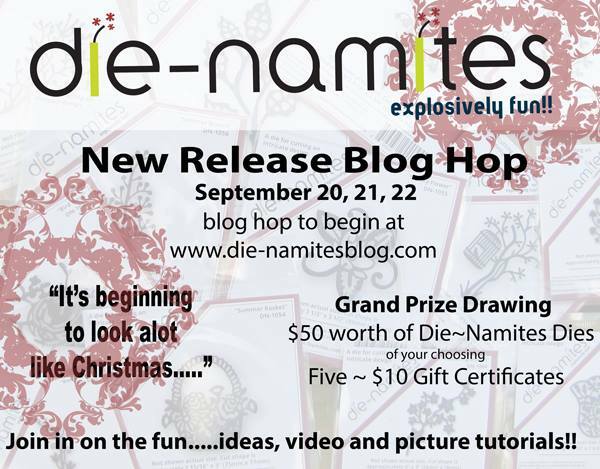 Hope you enjoy the “Premiere” Die~Namites Dies Blog Hop!!! Today I am sharing a quick Project Life weekly title card tutorial using the Flowering Branch Die as well as showing a few of the NEW Die-namites dies! Be sure you collect my secret word at the bottom of my post and leave a comment, I would also love if you would follow TheCraftyPickle as well so I can share even more Die-namite inspiration with you! 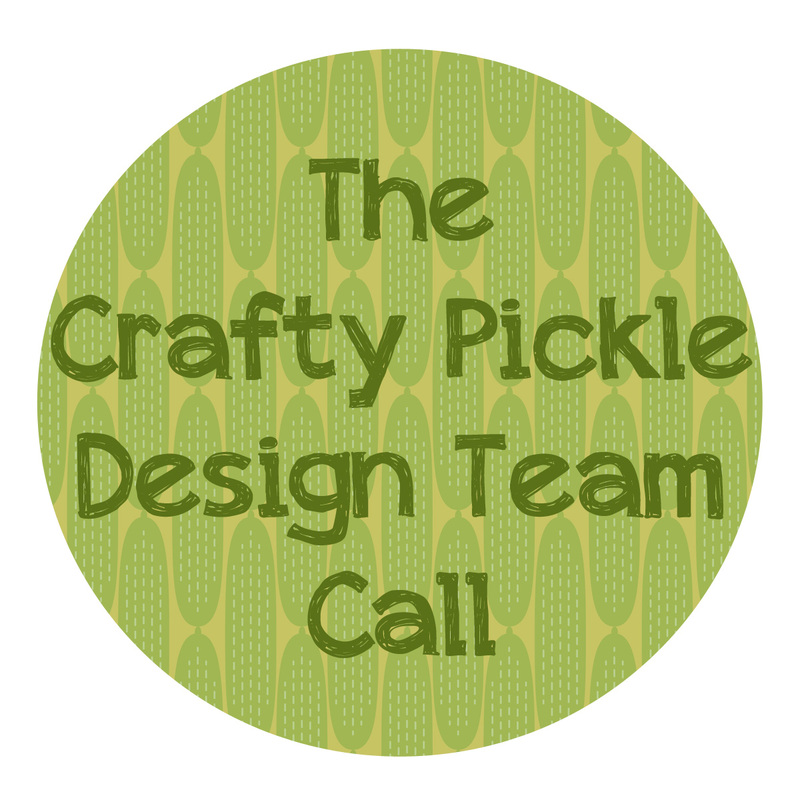 Thank you so much for stopping by TheCraftyPickle! Now head on over to Dunja Dücker’s blog to continue the “Premiere” Die~Namites Blog Hop!! 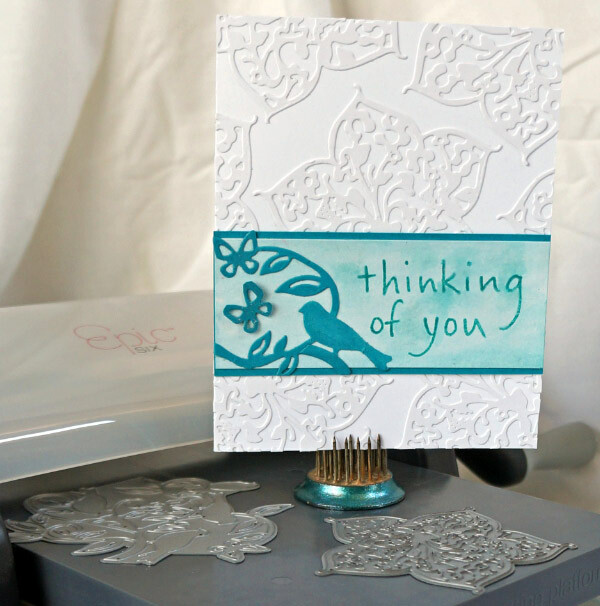 Thinking of you….. A dry embossed look using die cuts! 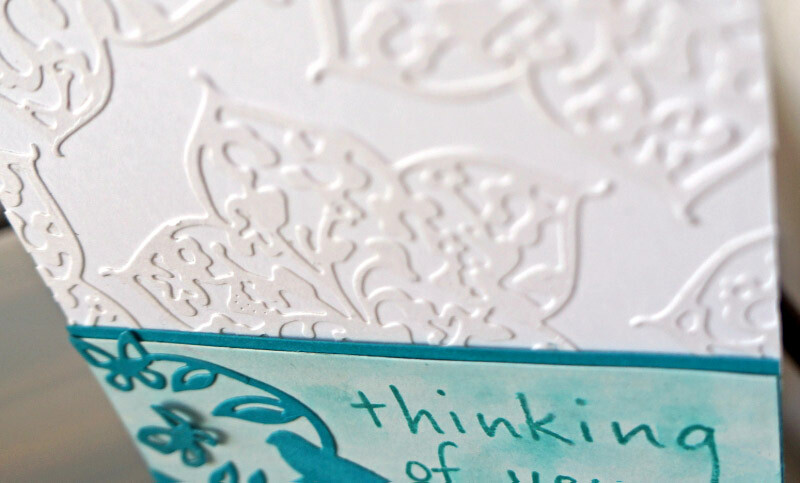 For this card I mimiced the dry embossing look with some intricate Die-Namites die cuts. The two dies I am using for this card are the Berry Flower die and the Birds on a Branch die. I am using this teqnique on a card today but this same look would be great on a scrapbook page, altered project or project life card. I used a total of 5 die cut shapes to do the entire card front. The key thing is to make sure that the die cuts are adhered down completely. I ran the die cuts through my xyron machine, but working with a glue pen would also work well as long as you are careful not to apply too much glue. Once I had my dies arranged, trimmed and adhered I took a rubber cement eraser and cleaned up any extra adhesive from in between the flower detail. I also took a nail file and lightly sanded the cut parts of the die cuts around the edge of the card to soften the edges and blend them into the card. This technique would also look beautiful as a scrapbook page background. 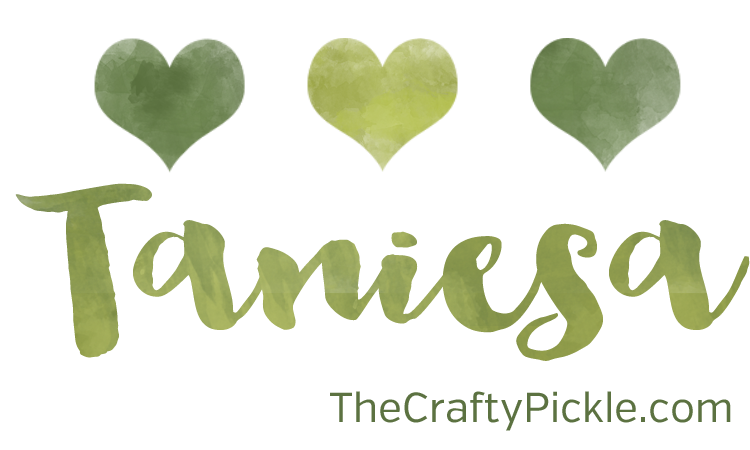 After the background was done I began working on the sentiment strip. I took a Close To My Heart ink pad in the Lagoon color and stamped some of the ink on a clear acrylic block I use for stamping. I removed a little of the ink at a time with a water brush and beginning at the edges of the white cardstock I added color working my way in towards the center. I love the watercolor look this achieved. I stamped the “Thinking of you” sentiment in the same color ink and then went back in with my water brush to add a little more color in between the letters. 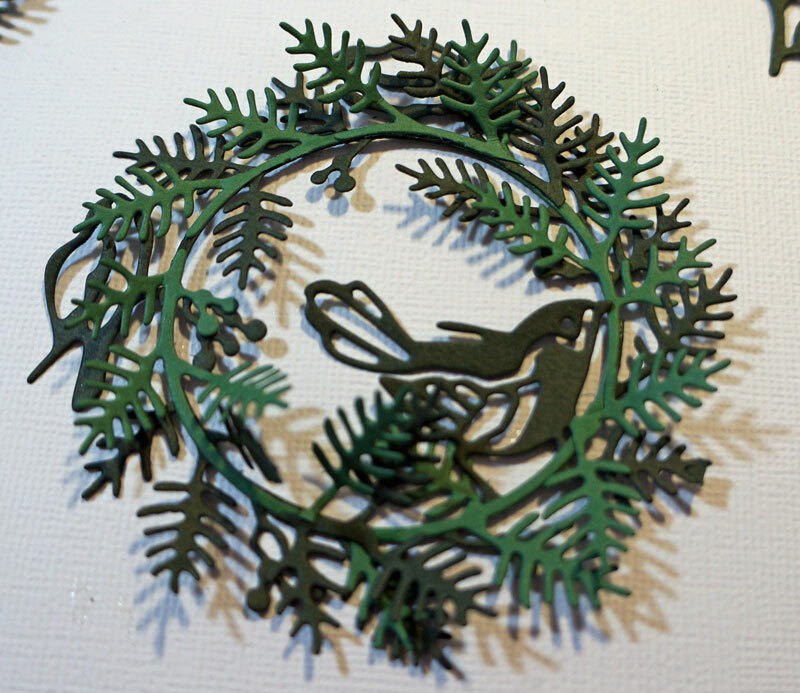 To complete the card I took the Birds on a Branch die and cut it in the same color cardstock as the border strip. I fussy cut a few of the pieces apart and attached them to the left of the sentiment. I finished by adding some glitter detail on the butterflies using a clear wink of stella glitter pen. I hope you enjoyed this fun little tip! The intricate designs of the Die-Namites dies are perfect for this look. 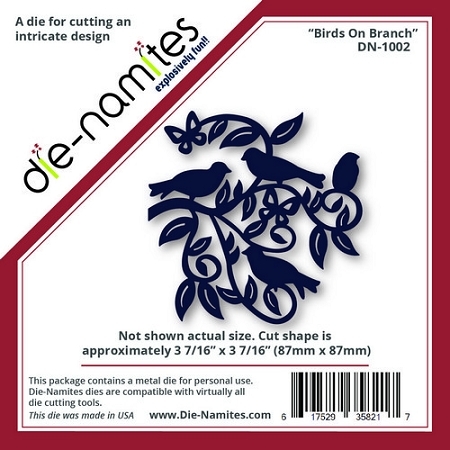 Experiment with any of the Die-Namites dies for a bit of POP in your next project! 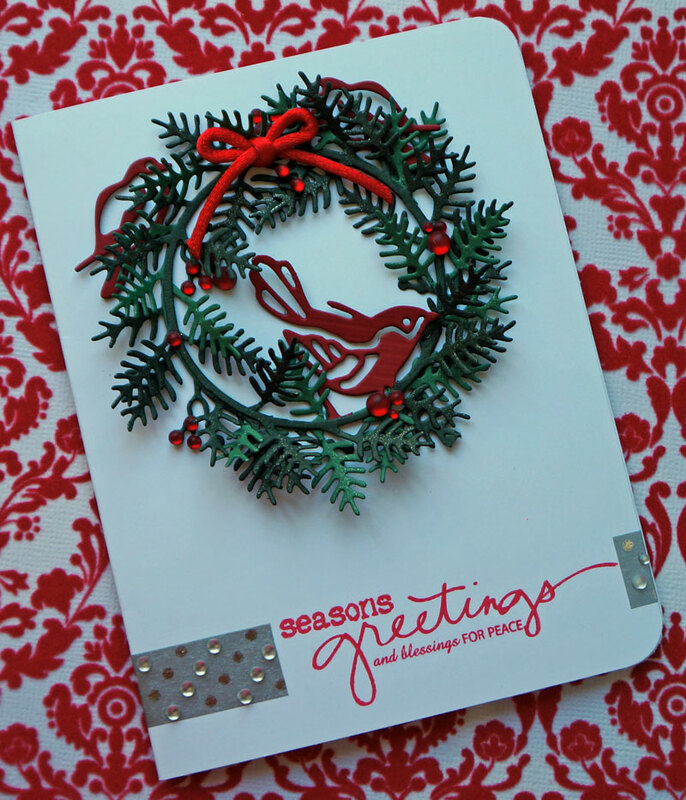 Check out more Die-Namite die cut tips and projects on the company blog!